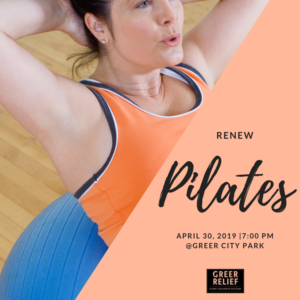 Join instructor Ana Davis, for a session of body strengthening Pilates. This class will be held on April 30th from 7:00 PM – 7:45 PM at the Greer City Park. Please wait until the end of the workout to ask your instructor for a RENEW Reward. RENEW Neighbors, 18 and older can earn RENEW Rewards for attendance. Register here.